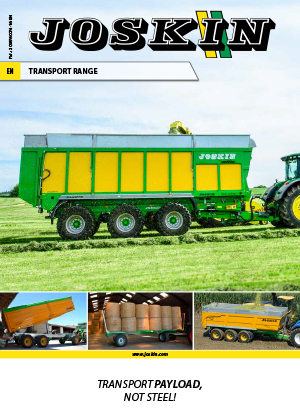 Joskin is building the world’s largest programme of trailers for transport and spreading of agricultural products. Its machines criss-cross the countryside all over Europe and in many regions of the world. Almost 60 countries are regularly served each year. Created in 1968 by Victor Joskin, the company has developed to become an international group keeping its strategic and financial independence and its family management. Joskin maybe best known for their market leading range of tankers, but there is much more on offer with the same premium quality synonymous with the Joskin brand. From the 2.4m BF Garden light pasture aerator to the 7.4m Renova Renovator with levelling and scraping blades, there is a product to suit the needs of any grassland operation. You will also find a variety of configurations available which include the conventional flexible scrapping tines, levelling scrappers, spreading paddles and heavy duty scarifying tines. Whether it is simple shape differences, dung, molehills or dead roots, the Joskin Aerator/Scarifier range will produce the rejuvenating results your require on the toughest of landscapes. JOSKIN monocoque agricultural tipping trailers (Trans-CAP and Trans-SPACE) embody the new generation of tipping trailers completely made of high tensile steel. Thanks to this fabrication concept, the empty weight is significantly reduced and therefore allows to transport still higher payloads. Your vehicle will then pay off more quickly. The body edges on the JOSKIN tipping trailers are smoothed off by successive folds of the two side sheets in order to limit the body/contents contact surface as much as possible when unloading. As a result, friction strains are significantly restricted too. With options of a trailed or semi-mounted Wago trailer, both are available in 6, 8 and 10m lengths. Furthermore, all axles are fitted with the hydraulic braking system. Will a height of 1,000mm (and 800mm as an option), this makes it easier to transport bales. The floor in chequered plate is also fitted with a 4cm side edge increasing the safety level during transport. 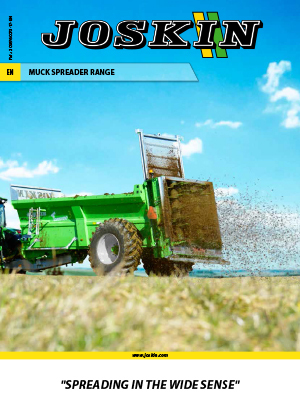 The Wago-Loader trailers allow to transport tools and other machines as well as straw. They are manufactured in special steel, cut and welded in an automated way, and fitted with floor crosspieces and a reinforced chassis, in order to benefit from a higher resistance and liability for various transports. 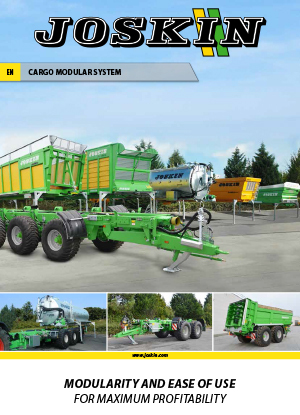 The Joskin Cargo modular system concept offers one and the same chassis for different transport and spreading tools. First select the appropriate chassis from options such as tandem or triple axle, abs braking, self-steering axles or even a hook lift system. Then select the bodies you require. So for example, you could have a muck spreader, tanker and monocoque body, but only one chassis. It is a flexible and economical solution. For a modular concept to be the most practical, it is essential that the basic implements can be placed/removed with few means and very quickly. Guides allow to place the implement on the chassis more easily. Implements are fixed on the chassis by means of 2 x 3 ‘‘Twist Locks’’ placed all along the chassis. The CARGO is fitted with rear hooks supporting the strains brought by the implement. The combination of these ingenious systems ensures a high comfort use and profitability. The Betimax RDS is fitted with the “reclining” system. The axle(s) is (are) mounted on double-acting hydraulic cylinders allowing to put the trailer on the ground. The loading and unloading height is therefore limited to 14 cm while the transport height is 63 cm. This reclining system replaces the access ramp, so that no operation is required from the user and accident risks are limited when loading or unloading the cattle. Every cylinder is fitted with a safety device preventing the vehicle from falling down if hydraulic hoses come to break. The BETIMAX R is designed on the same basis as the RDS. The main difference is that it does not have a reclining suspension. It also has a rigid drawbar and a loading ramp. The 210cm high body is fully painted. The ramp is standard fitted with two return springs for an easy lifting. A hydraulic ram for an effortless lifting is also available as an option. The Trans-KTP dump trailer models are conceived and designed for the hardest works. Given their sturdy design, their body with side walls and floor fully made of 6 mm HARDOX 450 (5 mm for 17/50) ensures their long-life span. The double-axle models are standard fitted with the JOSKIN Cross-Over bogie and the 27/65 TRM with the Hydro-Tridem hydraulic suspension. These running gears ensure a high driving comfort on uneven ground. Furthermore, the 27/65 TRM is standard fitted with a double self-steering system (first and last axle), which further improves the manoeuvrability. All these models are also standard fitted with a bumper that retracts hydraulically as the door opens. The Joskin Siroko spreader with lowered galvanized body is remarkable in many ways: its innovative design makes maintenance much easier. The cross-suspension hitching and the large dimensions of the wheels provide it with an excellent stability both when working and on the road. Its body in HLE 550 high tensile steel is made up of successive foldings and has a rectangular upper strip. The side walls of 850 mm, 1,090 mm, or 1,340 mm high offer a load capacity from 5 m³ to 14.17 m³. According to the product, the two beaters with folded spirals split and spread from 7 to 10 m away per row. The Tornado3 is also a muck spreader with lowered narrow body in HLE steel and wheels with a large diameter as well. Its high capacities and sturdiness are ensured by its body made up of successive folds and by a side reinforcing post. This body with a height of, 1,130 mm to 1,570 mm (offers load volumes from 8,6 to 25,8 m³ according to the model. The beaters with folded spirals spread evenly on a width from 7 to 16 m per row, depending on the product. Both Silo-Space and Drakkar trailers are made up with a set of vertical posts supporting side and rear walls made of profiled sheets. In order to ensure their sturdiness, the moving floors of the Joskin Silo-SPACE are standard made up of 2 moving parts with chains driven by 2 hydraulic motors with side box. Their profiled slats are alternately placed in order to ensure an even load distribution. The Drakkar has an industrial fluid-tight conveyor belt that is going, for the unloading operation, to transport the material. This high-resistance conveyor is rolled up on a cylinder driven by 2 hydraulic engines at the back of the trailer. During the unloading operation, the front wall, which is connected to the moving floor, is going to support the material without compressing it. At the end of the operation, it is going to have a pushing effect resulting in compact and firm heaps. The pasture topper is the ideal tool because it chops and spreads the grass: in this way, the remains are turned into fertilizer. Besides, the chopped residue is well digested by young calves and dry cows. More technical arguments are also in favour of the pasture topper: easily adjustable cutting height, sturdiness, reliability and limited maintenance. With in-line and fully offset options with between 2 and 4 rotors, there is a topper to meet all requirements. The brand Joskin has been linked with slurry tankers since 1984 when it produced it first tanker. Since then Joskin has lead the way in quality, reliability and innovation. Tankers are built to handle from 2,500 to a whopping 32,000 litres, meaning there is tanker in the range to suit any size of operation. 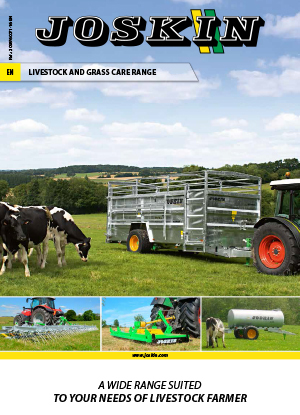 Choose from models such as the Komfort 2 which is fitted with an independent chassis and a cross-spring hitching suspension protecting the tank from all strains. Or the Volumetra, which is specifically designed to carry a large capacity in compact dimensions. But if you need a simple machine at a competitive price, but still seek the Joskin premium quality of tanker, look no further than the Modulo 2 range.